Okay, The Legal Genealogist is off gallivanting (again, I know…) at the Institute of Genealogy and Historical Research at Samford University in Alabama. Teaching in three different tracks, I’m a bit … um … busy, might be a good word. So… how to keep my loyal faithful readers entertained and educated? Just make sure everybody hears about this amazing episode of the podcast Fieldstone Common with friend and professional genealogist Marian Pierre-Louis: FC 92 Uncommon Law with Paul Gillies. 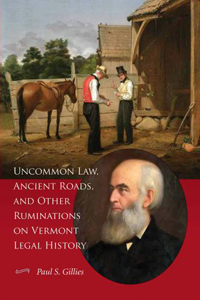 Paul S. Gillies is the author of the book Uncommon Law, Ancient Roads, and Other Ruminations on Vermont Legal History. This book shows us the importance of understanding how laws came about and their significance in helping us understand history. The 25 essays collected in this new book from the Vermont Historical Society examine the founda­tions of legal thought in Vermont, historical issues ranging from log drives to the keeping of sheep to blue laws, the state’s legal luminaries, and contemporary issues including ancient roads and Act 250. Vermont was born in conflict and existed as an independent political community until becoming the 14th state in 1791. During those early years Vermonters had to chart their own course in matters of law. From these unique origins, the history of law in Vermont traces the evolution of social and economic developments over time and provides a fascinating lens for understanding the history of the Green Mountain State. In this interview Paul Gillies and I talk about a variety of items from Vermont legal history such as the implication of towns settling the first minister and distributing land to him. We also dig into the importance of fences and why they were needed over the centuries. We discuss ancients roads that are still legal roads even though they only exist on old maps. We also discover three luminary characters from Vermont legal history – Nathaniel Chipman, the scandalous Royall Tyler and John Mattocks. Entertaining and educational all in one.